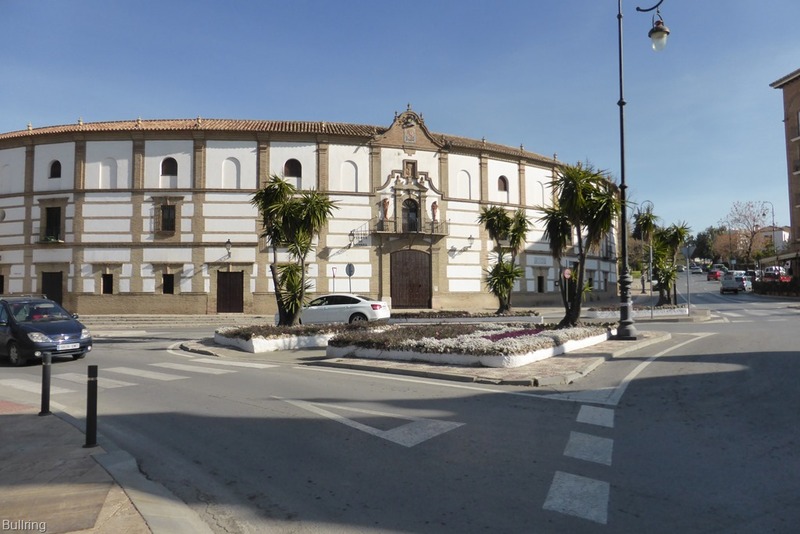 We left Manta Rota after setting TomTom to Antequera as a stop for the night, which seemed a reasonable distance about 300km, as it would be on motorway quality roads, all the way. 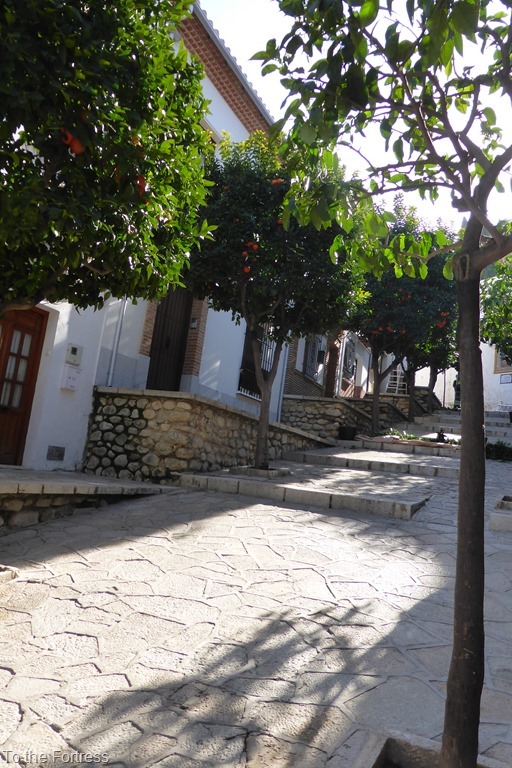 We stopped first at Villa Real de Santo Antonio, Lidl to stock up with groceries and the camper stop to empty down and fill up with water. Then onto the bridge over to Spain in the direction of Seville. Bye-bye, Portugal for this year, we’ll be back. It was a good journey apart from quite a bit of traffic going through Seville but TomTom switched us from lane to lane faultlessly. We were aiming for a Camper Parking area we had stored on our Autoroute map (GPS: N37.19886,W4.571867), we have thousands of places marked from all sorts of sources, this one we had downloaded from the “Bumbles Blog” www.OurBumble.com written by Craig & Joanne who are full timing in a similar Hymer to ours. They have published a complete list of all the places they have stopped on their travels around Europe. Thank you both, hope it’s still there when we arrive. 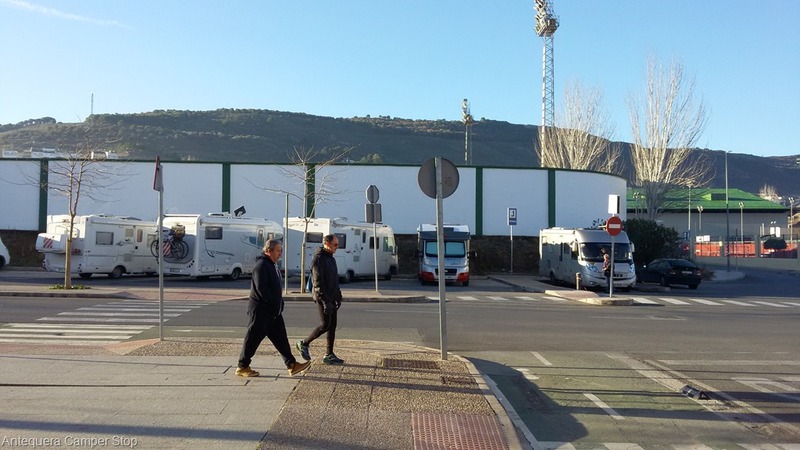 We arrived at 6pm and it was a sort of lay-by next to the sports stadium, set back from the road behind the pavement with about twenty marked out spaces specifically for Motorhome use. They were wider and longer to accommodate our bigger vehicles leaving adequate space between. The council had also created a waste water, drive-over dump, a toilet cassette dump and fresh drinking water free of charge, that’s us at the service point on the right. 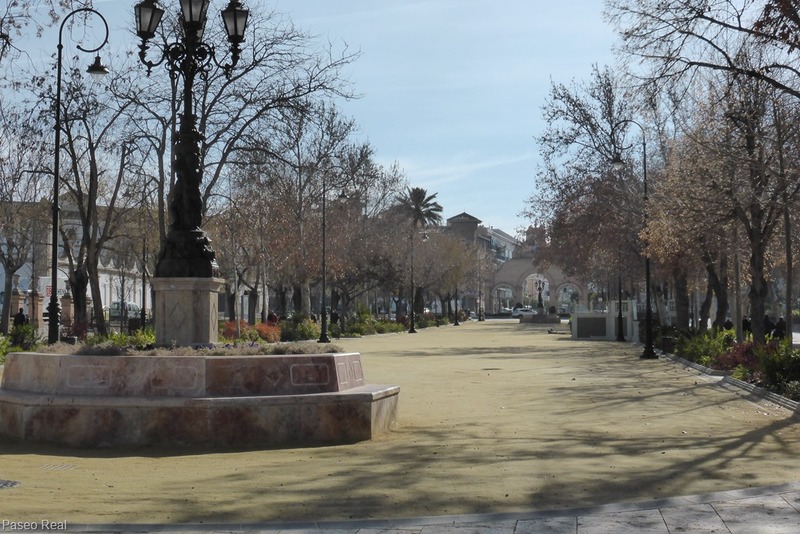 Thank you very much Antequera, this sort of facility lets us visit your town, see the sights and spend money. Once we were set up it was backpacks on and off for a bit of sightseeing but we had great trouble setting the alarm, we had experienced this before when parked near military establishments or large police buildings because the high intensity of radio emissions seems to block the remote fob signals but this was strange because we were next to a football stadium which was unlikely to have large radio transmitters. 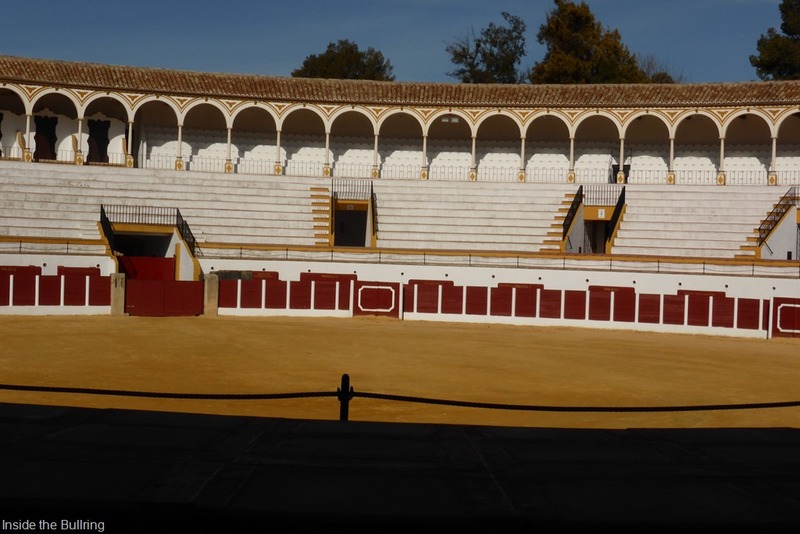 But after quite a few tries Steve managed to get it to set ok.
After a short walk we came to a sort of park Called the Paseo Real, with this long hard clay area which we think is possibly a display area for horses and perhaps Matadors from the nearby Bullring. The next day we actually managed to sneak in past the open kitchen door to take a quick photo of the inside of the bullring through a metal gate, we got yelled at by one of the kitchen porters, but it was too late because we had already taken it. We also came across this wonderful play park, probably the safest looking one we had ever seen. 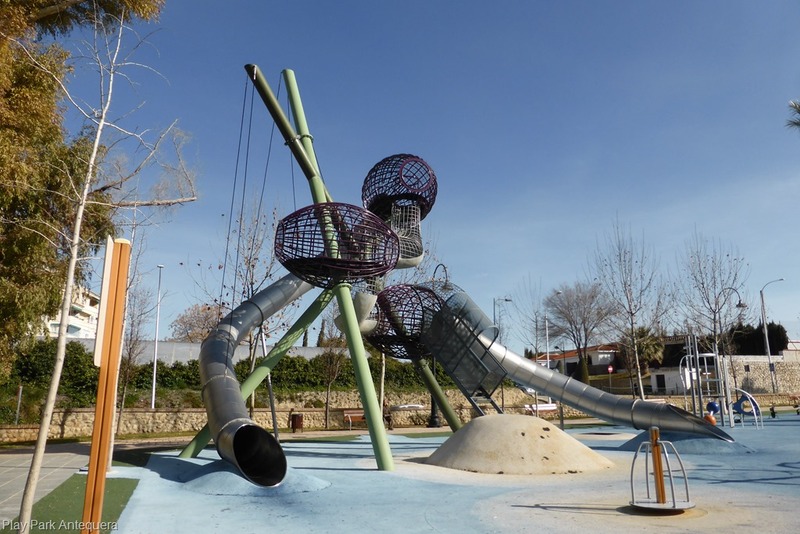 The only problem we could see though, was, if a child got to the top pod then was too frightened to go down the slide, it could be a problem for an adult to get up through the little tunnels to help them down. Click the picture for a bigger view and you can see what I mean. Most of the non food shops shut in the afternoon and re-open in the evening so while we were walking about in the early evening, the whole town was buzzing. 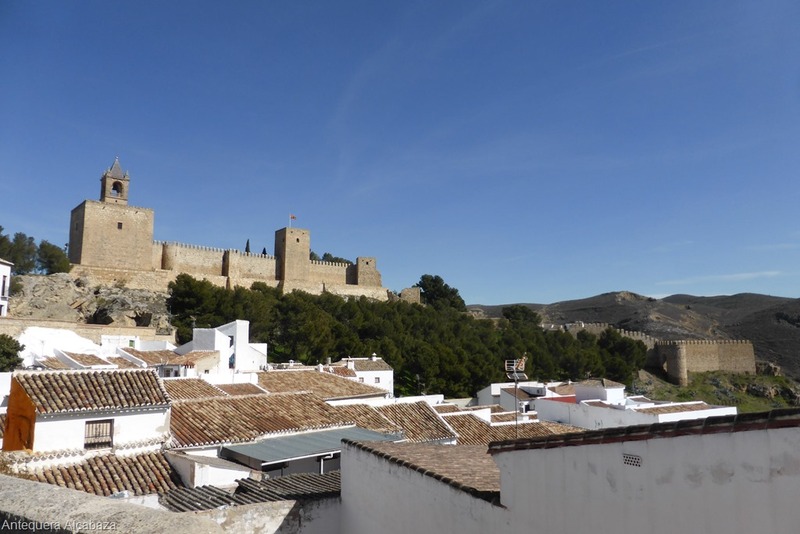 We finally found the beginning of the Old Town and the Information Office which was closed till the morning so we worked our way back to the motorhome, convinced that we were going to enjoy Antequera. When we got back to the motorhome Steve again had a bit of problem switching off the alarm but again managed after a few tries. We were up and out by 9am and on our way to the information centre. Armed with a map, annotated as usual by the staff there, we climbed the very steep hill to the Alcabaza (Fortress) on the top. When we arrived outside the gates the view was breath-taking. 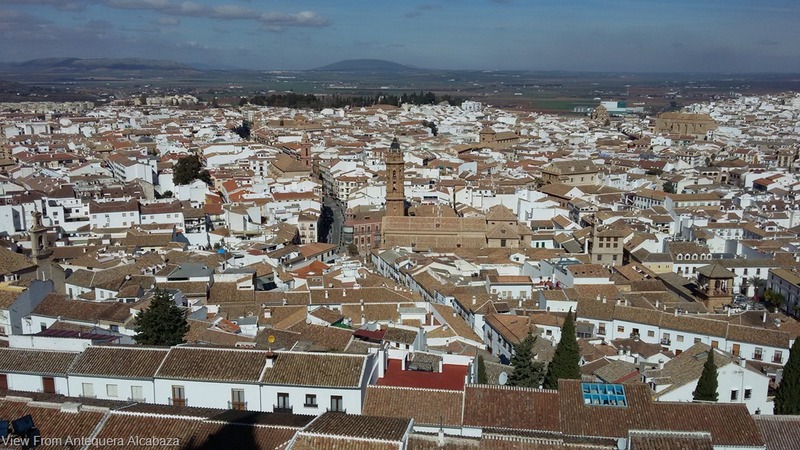 The whole town with thousands of little white houses was spread before us and also dozens of church spires and towers. As the title says, “How Many Churches Does One Town Need?” After dozens of photos we went into the ticket office. “Two Seniors Please”, says Steve. “Are you over 65 says the lady?” a bit embarrassed. “We certainly are.” says Steve “But thanks for doubting it. You’ve made my day.” Steve is 69 this year and Judy 75. It must be all the walking and fresh air. 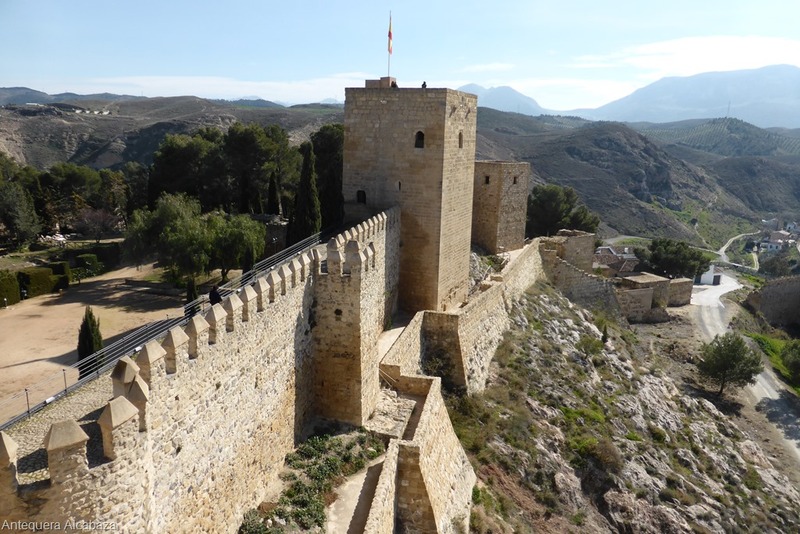 The Alcabaza was originally a Moslem Fortress along the lines of the Alhambra Palace in Granada until taken by siege by Christian Prince Ferdinand in 1410. The walls and towers are well preserved but the interior only has the hint of the original Muslim splendour. It doesn’t have the water that makes the Alhambra what it is. 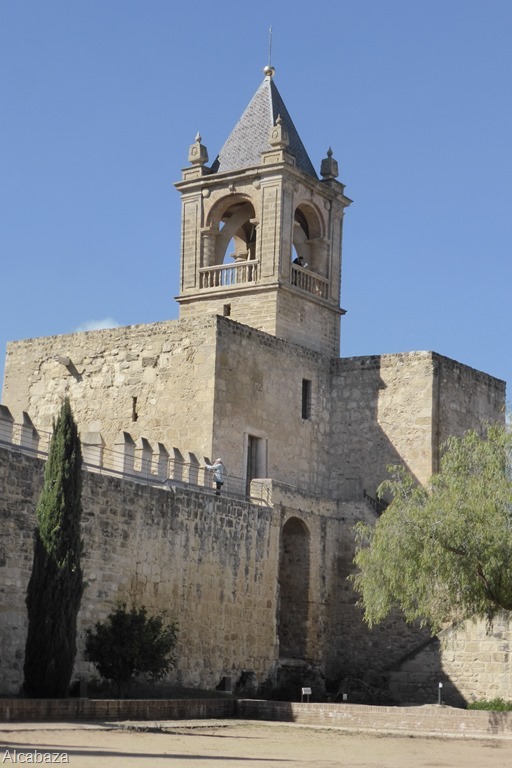 We spent about four hours walking round the fortress and its grounds and the adjacent Cathedral like Church, with an audio guide which was included in the €3 seniors price. We continued to walk around the Old Town amazed by the architecture of the ancient buildings and churches and chapels and Convents. All somehow slotted into a maze of tiny streets. 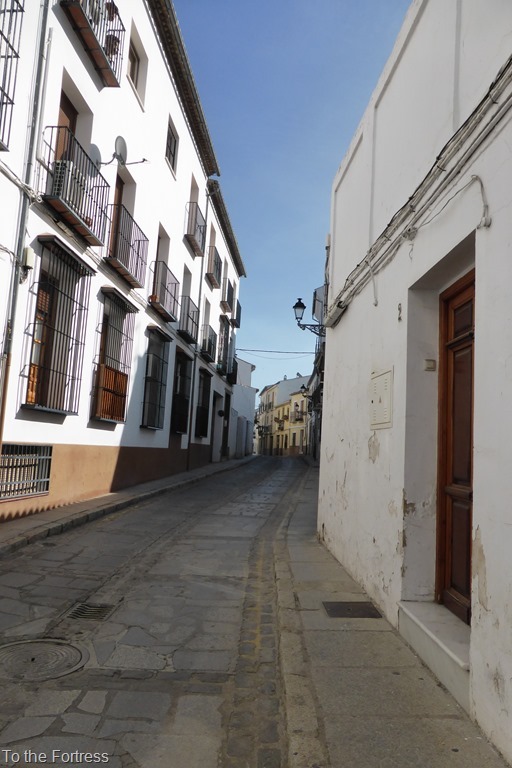 Unfortunately it was now siesta time so all the buildings were closed, but certainly a place to visit another time. One day of culture is perhaps enough. Our fit-bit device,because of all the walking we have done is now demanding 15,000 steps a day which we have achieved today but perhaps a little less hilly tomorrow. We walked back to the motorhome via Lidl because we had forgotten something at the last one, so we returned to the camper by a different road and passed a large police headquarters, about 100mtr from the parking, which explains our alarm problems. Unfortunately when Steve pressed the button, this time it refused to disarm so with Judy outside to apologise to the neighbours, Steve dived in to a cacophony of deafening sirens, it only took a couple of seconds to disarm it from inside but his ears were ringing for about half an hour afterwards. They said when it was installed that with the six extra loud sirens, it was difficult to rob a vehicle with your fingers in your ears, and we believe them now. 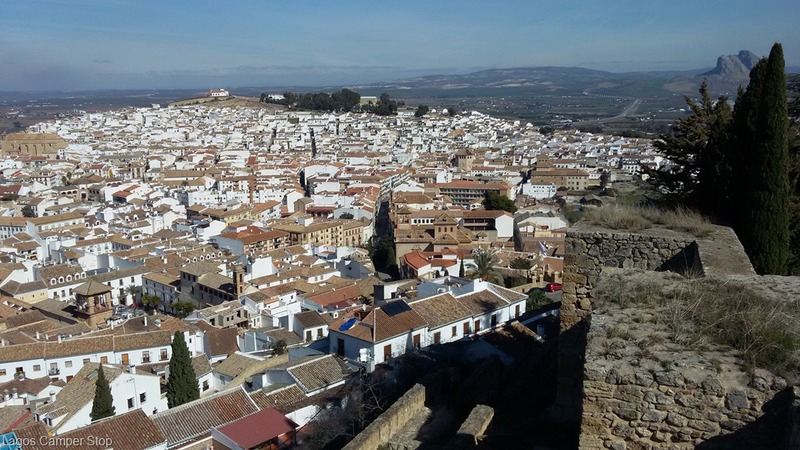 So a good experience in Antequera, to be repeated. We will visit the nearby Dolmen’s tomorrow which are said to be spectacular. How interesting. 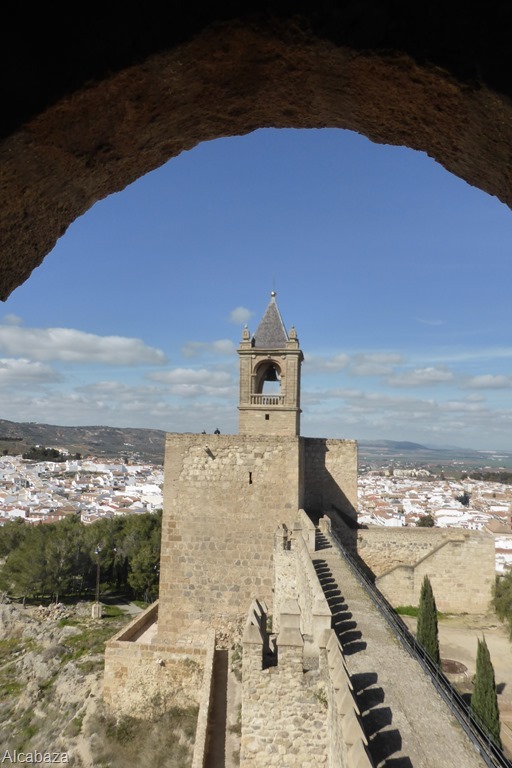 We had the same experience at Antequera with our alarm. Embarrassing and a bit scary. We just assumed it was a random fault. Our immobiliser also refused to disarm while we were on the services. It’s a shame because now we know it’s the place it would put us off returning. We loved the town. Yes, The Bumbles had the same problem, as I said, it’s the police station. I wouldn’t have worried if I had seen it before. We did find another large car park up behind the Bullring which allowed Motorhomes, the big long ones, too big for the Aire seemed to be there. So If we go again and I think we will, then will try there.